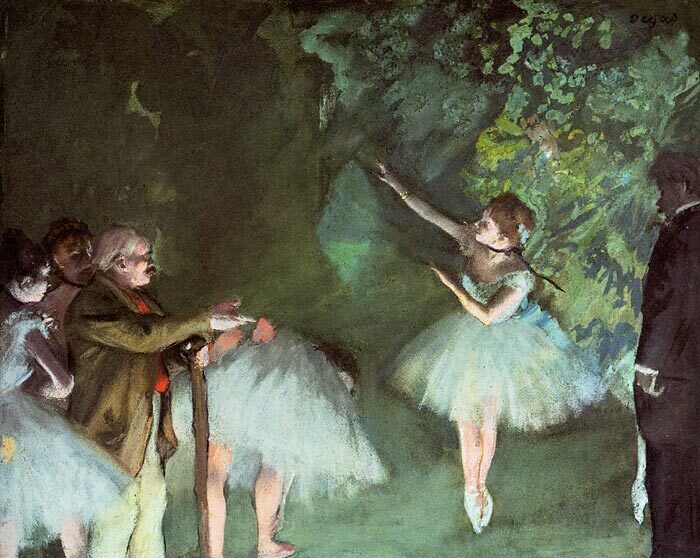 The visual artist most closely associated with the ballet, is Edgar Degas ,whose depictions of the dance seem to probe the very bases of the form. His large classroom scenes juxtapose different types of movement, both natural and choreographed, and imply the transition between the two that dancers are continually making. In other representations, Degas fixes the transient poses of dancers stretching or practicing and captures the paraphernalia of the nineteenth-century practice room, including musical instruments, the barre fixed to the wall, and a watering can for moistening the floor . Some of Degas' paintings display particular poses in the ballet repertory, demonstrating his comprehension of technique .Other paintings probe the details and the consequences of the dancer's life .Few of Degas' paintings depict performances, although a notable series of pastels features a rehearsal on stage, ( this painting , Ballet Rehearsal applies to this series )in which dancers in costume execute their combinations around the ballet master who coaches them, while on the far right, two portly male observers sit artlessly in chairs .Like the classroom paintings, these point out the contrast and the link between dancing and mere movement, but they also show Degas repeating and refining the same composition, very like a dancer practicing the same time-honored motion. SPECIAL NOTE : The painter will make the reproduction as close to the original oil painting as possible. If you want your painting to alter from this likeness, please email us and " Ballet Rehearsal, c.1875 " will be reproduced according to your special requirements.